Bose SoundLink devices are portable wireless speaker systems manufactured by Bose Corporation, which can play music transmitted over a wireless connection from a computer or smartphone. There are several models produced, using various wireless protocols, principally Bluetooth. All the systems include rechargeable batteries, external power-supply adaptors, and standard 3.5mm sockets for connecting wired sound sources. In August 2009, Bose released the SoundLink Wireless Music System. This consists of a speaker unit (weighing 8.4 kg (19 lb)) with a carrying handle, a USB wireless transmitter which is plugged into a computer, and a handheld remote control unit which controls both the speaker and the source. The wireless connection protocol is not disclosed by Bose, though many users are able to connect to the system over Bluetooth; the transmitter unit is seen by the host computer as simply a USB speaker. At the time of release, its US recommended price was $550, which reviewers commented seemed excessive. Released in September 2011, the SoundLink Mobile is much smaller than the original SoundLink, and consists of just the speaker unit, weighing 1.3 kg (2.9 lb), and the charging adaptor. It operates over a Bluetooth connection. It features a protective cover, which wraps around the unit's back and base and front panel. The section covering the front panel is held in place magnetically, and acts as an on/off switch, similar to the Apple iPad's Smart Cover; it is folded underneath the unit to act as a necessary stabiliser while in use. The standard cover is covered in black Cordura-type nylon, but alternative covers are also available, in various colours and in leather. The cover is essentially fixed, being replaceable only with the use of tools. Internally, it features a rechargeable lithium-ion battery, four front-facing speaker drivers, and two opposing passive radiators (one each front- and back-facing). Its US recommended price at time of release was $300. Reviewers have praised the unit's sound quality, build quality, and portability, but criticised the high price and lack of a microphone (to enable its use as a speakerphone). The second version, the SoundLink Mobile II is similar to the original, distinguished mainly by the cover's front-panel section being foldable in half (to reduce the device's footprint while in use), and stored settings for up to six previously-paired Bluetooth devices, to enable automatic re-pairing. The SoundLink Mobile III was introduced in February 2014, still at US $300. Compared with its predecessor, the styling is different, swapping the fixed magnetic cover for an optional slip-on cover available in various colours. Battery life and speaker power are also increased, as has sound quality, according to Bose. Reviews have remained positive, but some now criticise the reliance on a traditional barrel connector for the charging adaptor instead of the Micro USB commonly used on modern mobile phones. The SoundLink Mini is a smaller and lighter version of the SoundLink Mobile, introduced in 2013 at a US recommended price of $200. It weighs just 1.6 kg (3.5 lb). It includes a charging cradle as well as a power socket. The case is made of sandblasted aluminium, and protective covers are available in different colours. As with the Soundlink Mobile, reviewers have praised the sound quality and build quality, but criticised the lack of a microphone.Meanwhile, there is a newer model the Bose SoundLink Mini II. The SoundLink Air uses Apple's AirPlay protocol instead of Bluetooth, and is designed for use with Apple computers and phones. It was introduced in 2013 at a US recommended price of $350. The only controls on the speaker unit are volume controls, at the side; as with the SoundLink Wireless Music System, a remote control unit is supplied which controls both the speaker and the source. The unit weighs 2.1 kg (4.6 lb), and is powered from a wall-plug adaptor; unlike the other SoundLink systems a rechargeable battery is only available as an optional extra. Reviewers have acknowledged the sound quality and build quality, but commented that competing systems may offer a better experience, and criticised the price of the optional battery and the bulkiness of the wall-plug adaptor. 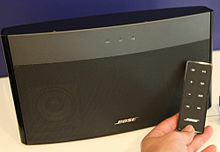 Unlike the other SoundLink devices, the Wave SoundLink adaptor is not a standalone unit, but is a wireless Bluetooth receiver that connects via a cable to the Bose Wave integrated audio system, allowing music to be relayed to the system from a computer. It was introduced in 2009 at a US recommended price of $150. The kit consists of the wireless unit and a USB transmitter which plugs into a computer. The adaptor is controlled by the Wave's remote control unit. ^ "New from Bose – Bose SoundLink wireless music system". Bose.co.uk. Archived from the original on November 5, 2009. Retrieved 2009-11-08. ^ Ehud Rattner (2010-08-15). "Bose SoundLink Wireless Music System". The Future of Things. Retrieved 2014-03-22. ^ "SoundLink® wireless music system". Bose. Retrieved 2014-03-22. ^ John Biggs (2009-07-17). "Bose SoundLink is like their iPod dock with out (sic) the dock part". Crunchgear. Retrieved 2009-11-08. ^ Matthew Moskovciak (2009-07-17). "Bose SoundLink Wireless Music System streams music from your PC to a portable speaker for $550". CNet. Retrieved 2009-11-08. ^ Jeremy Horwitz (2011-11-23). "Review: Bose SoundLink Wireless Mobile Speaker". iLounge. Retrieved 2014-03-22. ^ Imrul Haque (2011-10-02). "Bose SoundLink Wireless Mobile Speaker". The Tech Journal. Retrieved 2014-03-23. ^ Sherri L. Smith (2011-12-12). "Bose SoundLink Wireless Mobile Speaker Review". Laptop Magazine. Retrieved 2014-03-21. ^ David Carnoy (2012-09-12). "Bose updates Soundlink Bluetooth Mobile II with better sound, adds AirPlay speaker". CNet. Retrieved 2014-03-24. ^ "SoundLink Bluetooth speaker III". Bose. Retrieved 2014-03-22. ^ "The Lexus of Bluetooth speakers". CNet. 2014-02-18. Retrieved 2014-03-22. ^ Seth Weintraub (2014-02-22). "Review: Bose Soundlink III portable Bluetooth speaker — is bigger best?". 9 to 5 Mac. Retrieved 2014-03-23. ^ Darren Orf (2014-02-26). "Bose Soundlink III Speaker Review: Uninspired Greatness". Popular Mechanics. Retrieved 2014-03-23. ^ Mike Kobrin (2014-03-11). "Bose SoundLink III Portable Bluetooth Speaker Review". Tom's Guide. Retrieved 2014-03-23. ^ William O'Neal (2013-08-14). "Bose SoundLink Mini review". TechRadar. Retrieved 2014-03-15. ^ Jeremy Horwitz (2013-07-08). "Review: Bose SoundLink Mini Bluetooth Speaker". iLounge. Retrieved 2014-03-22. ^ "The wireless speaker Apple could have made". CNet. 2013-07-15. Retrieved 2014-03-22. ^ Philipp I. (2014-07-15). "Bose SoundLink Mini im Test". Lautsprecher.org. Retrieved 2015-07-07. ^ Tim Gideon (2012-09-24). "Bose SoundLink Air Review". PC Magazine. Retrieved 2014-03-18. ^ "SoundLink® Air digital music system". Bose. Retrieved 2014-03-22. ^ Jeremy Horwitz (2013-05-29). "Review: Bose SoundLink Air AirPlay Digital Music System". iLounge. Retrieved 2014-03-22. ^ Lex Friedman (2013-01-02). "BOSE SoundLink Air Wireless Speaker review". TechAdvisor. Retrieved 2014-03-22. ^ Vishal Mathur (2013-05-07). "Bose SoundLink Air Review". ThinkDigit. Retrieved 2014-03-22. ^ "SoundLink Color Bluetooth Speaker". Bose. Retrieved 2014-11-26. ^ "Bose SoundLink Color review". CNet. 2014-10-08. Retrieved 2014-11-26. ^ Alex Colon. "Bose SoundLink Color Bluetooth Speaker". PC Magazine. Retrieved 2014-11-26. ^ Gopal Sathe (2014-10-01). "Bose SoundLink Colour Review: Big Sound, Small Package". NDTV. Retrieved 2014-11-26. ^ Rachel Cericola (2009-11-18). "Bose Wave SoundLink Music System Review". Digital Trends. Retrieved 2014-03-22. ^ "Wave Bluetooth music adapter". Bose. Archived from the original on 2014-03-23. Retrieved 2014-03-22. This page was last edited on 16 October 2018, at 10:41 (UTC).